The Book of Enos constitutes a brief literary masterpiece. A close reading of Enos’s autobiography reveals textual dependency not only on 1 Nephi 1:1-2 and Genesis 32–33, but also on earlier parts of the Jacob‑Esau cycle in Genesis 25, 27. Enos’s autobiographical allusions to hunting and hungering serve as narrative inversions of Esau’s biography. The narrative of Genesis 27 exploits the name “Esau” in terms of the Hebrew verb ʿśh/ʿśy (“make,” “do”). 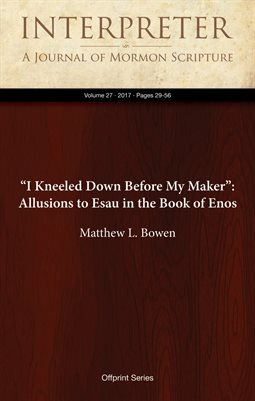 Enos (“man”) himself incorporates paronomastic allusions to the name “Esau” in terms of ʿśh/ʿśy in surprising and subtle ways in order to illustrate his own transformation through the Atonement of Jesus Christ. These wordplays reflect the convergence (in the Genesis narratives) of the figure of Esau before whom Jacob bows and whom he embraces in reconciliation with the figure of the divine “man” with whom Jacob wrestles.